When people think of projectors the first thing that comes to mind is the optical device that projects the image. However, there are two parts to every projector system: the projector and the projector screen. Without the screen or surface, nothing happens. 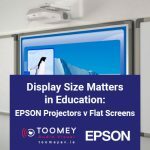 This post is about the projector screen and how important it is in classrooms across the country today (you can view our guide to projectors for schools here). The art and science of ‘throwing’ images onto a flat surface probably has its origins in pre-history with primitive shadowgraphy or shadow play. Since then projector technology has evolved in leaps and bounds but the projector screen is still basically the same: a good, clean and flat surface. In schools and colleges, it is important that projector screens be of high quality. This means a quality surface and support structure for the screen. Projector screens are recommended over whiteboards and walls simply because they deliver a superior image. The information needs to be clear, bright, crisp and accessible to all in the classroom. 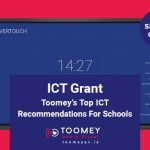 What happens on that screen is the most important aspect of education, so it is vital that the screen be of quality and that it be suited to the projector. There are many different types of projector out there and many different types of screen. We will ensure that you get the right pairing of projector and screen so that you can optimise the basic learning experience that is common to all educational institutions. Think of an artist and his canvas. Before he applies one single brushstroke he has to know that the canvas is the right size, shape and constitution for what it is he wants to paint. The same is true of the projector and screen. The basic pedagogical mode of education simply can’t exist without that ‘canvas’. For many years it was the blackboard. This was replaced by the whiteboard. These days many schools and colleges are opting for the projector and screen for quality, convenience and efficiency. Indeed, they have become ubiquitous in educational institutions across Ireland. Pairing a projector with a projector screen is not easy. It is both an art and a science. 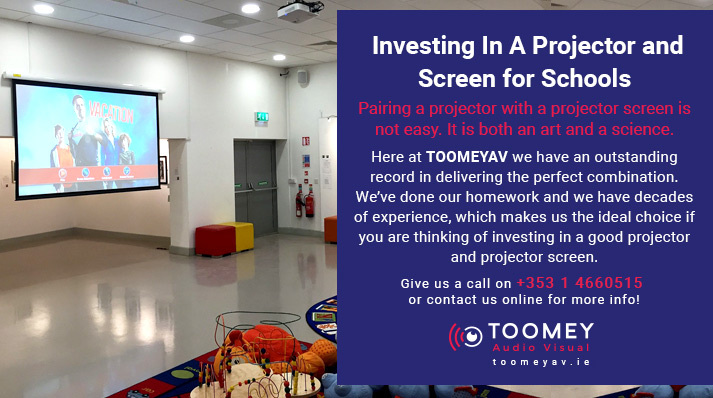 Here at ToomeyAV we have an outstanding record in delivering the perfect combination. We’ve done our homework and we have decades of experience, which makes us the ideal choice if you are thinking of investing in a good projector and projector screen. Some philosophers say that the mind begins as a clean slate or a blank canvas. We are proud to play our role in filling that canvas, quite literally, with knowledge. 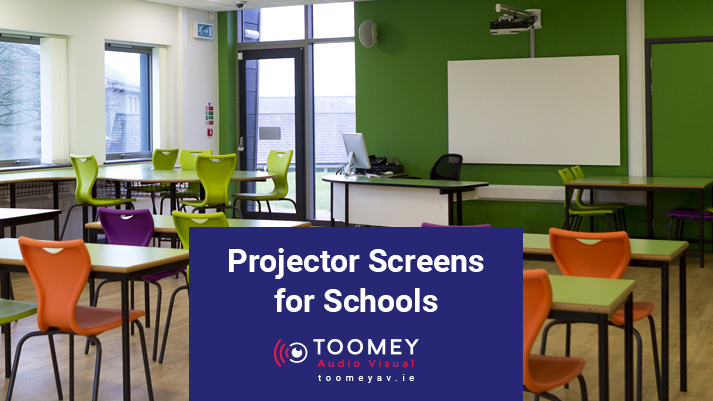 We deliver and install high quality, well supported, projector screens in schools across the nation. We take everything into consideration such as size and shape, manual or electric, remote or wall switch and installed or portable. Our best sellers include the portable 1.5mtr tripod screen, the 1.8mtr wide manual screen and the 2.4mtr wide electric wall screen. 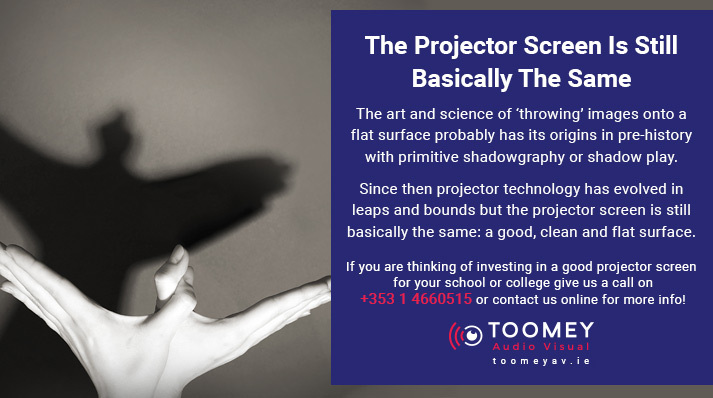 So, if you are thinking of investing in a good projector screen for your school or college, why not take the headache out of it and contact us today for info and advice? Give us a call on +353 1 4660515 or contact us online for more info! Don’t miss out on future blog posts and be in with a chance to win a €100 voucher by joining our mailing list now! For any event project screen is a must. Now is it important in classes, conferences etc. Really digital world is changing the way we interact. We understand the importance of quality, reliability and experience when buying AV equipment. Contact Toomey AV Today! Signup to our news letter below.